Teller Currency Recyclers will provide more accurate transactions, increase teller line productivity and improve your customer's experience. Self Auditing. You can audit the contents of the unit without removing cash from the unit. This eliminates the security concerns that come with removing the cash and re-entering it into the unit as well as the need for dual control of the loose cash. External Transit Cassete - Cash can be directly loaded from and unloaded to an external transit cassette. This decreases manusl cash handling, risk, fraud and dual control costs. 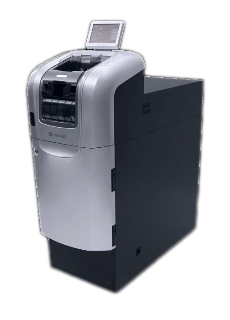 Speed and continuoud feed - the Monisafe 500 is extremely fast. Both input and output rate is 12 notes per second. Continuous feed capability allows bulk deposit processing wioth no note limit. Plus it eleminates the need for dual control during cash vault functions.